After being diagnosed with tendonitis, I stopped knitting. In fact, I had stopped knitting before because of the pain but I was still trying. Being unable to enjoy one of my favourite passtimes, I ripped a few old things, found some patterns and even bought one or two. You know how stingy and cheap I am so wonder freely. 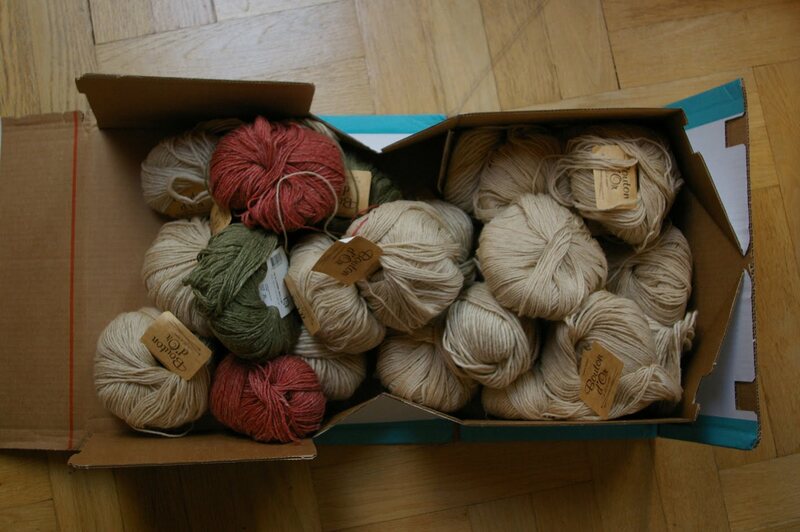 Namely 7 balls of Steppe by Bouton d'Or to finish said sweater and 16 balls of Perenne - a stunningly beautiful wool and linen blend. I was wise and ordered enough for a sweater or even two although I hope I'll be able to get more from the Bouton d'Or directly when it's on sale. I've spent too much money on patterns, you know. I'm knitting another garden variety sweater as my Ravelympics (US Olympic Committee, stick it up your... ) project. Taiyo Sock, colour 8, brown bits hacked off, 2 or 2,25mm needles, alternating balls every row, my basic sweater recipe, lots of mindless knitting because I'm really watching the events. Diadomina by Diakeito, colour 215, I think, and Silk Garden Lite, I think 2046, because I got the yarn as a gift from a fellow Raveller in the form of unloved sweater. I guess it may neeed some colour highlight and I'm not sure about the blue bits.